Hi, I’m Dr. Debby Pollack. I grew up in Arkansas and came to Atlanta in 1994 for my pediatric residency at Emory University after graduating from the University of Alabama (Roll Tide!) for undergrad and medical school. My husband and I moved to Decatur more than 20 years ago and feel very fortunate to be raising our children here. 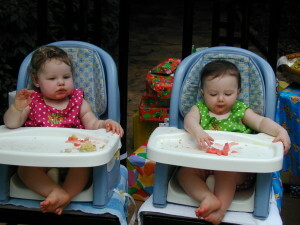 My husband owns a chocolate factory and we have three children-our son is 16 and our twins girls, pictured here 12 years ago, are now 13! I love my work at Dekalb Pediatrics and really enjoy getting to know the wonderful families I see here. Away from the office, you can usually find me reading for fun, tap dancing or going on long walks around Decatur. I’m excited about our new blog and because I hear about picky eating almost daily in the office, I wanted to start off by sharing some ideas about how to help prevent picky eating before it starts. Most children become more selective after 12 months of age, but I hope this approach will help prevent normal toddler selective eating from turning into a battle at your dinner table. When you introduce solids for the first time at 6-9 months, try to keep every meal experience positive. It’s okay to laugh when your infant spits food out, but don’t show disappointment if they don’t like something you offer. Keep offering new foods for 2-3 days, always with a smile. Then reintroduce the foods your baby doesn’t particularly enjoy every few weeks. Try to think about meals more as a way to experiment with tastes than worrying about the quantity of food your baby eats. When you transition to finger foods (usually beginning at 7-8 months), make sure you mostly offer healthy foods like fruit and vegetable pieces and quickly move away from the dissolving puffs and cheerios. Expect your baby’s appetite to diminish after 12 months as his growth decreases. Serve small portions and offer more if your baby finishes her meal. Let your baby get messy. Encourage her to touch, lick, smell and taste new foods. Don’t be concerned if your toddler refuses to eat a meal. There will be meals where he is just not hungry. Don’t pressure or try to bribe your toddler to eat more, it will just teach her to not listen to her own hunger signals. Almost every toddler becomes more selective about their favored foods. Hopefully with an approach that allows your toddler to occasionally refuse a meal, you won’t feel like meals are a huge struggle. I love Ellyn Satter’s “division of responsibility in feeding”. Your job is to provide your child with healthy foods and pleasant meals and snacks; your child’s job is to decide which of these healthy foods to eat and how much to eat. You can find more about the topic on Ellyn’s website, www.ellynsatterinstitute.org. In the future I’d love to share some thoughts with you about healthy eating, discipline and the challenges of parenting, but would also love to hear from you about topics you are interested in. Please drop me a note through the portal or talk to me in the office about any suggested future topics.